Disclaimer: this is a terrible scan of a low resolution photo, that was printed at a small size. Now, I don’t even wear a watch (haven’t for 15+ years) and yet I was compelled to visit the American Clock and Watch Museum in Bristol, Connecticut. Why? It’s fascinating to study a collection of a single item; to watch its progression over time (no pun intended in this case) and to see how pop culture influenced the functional in classic and tacky ways. 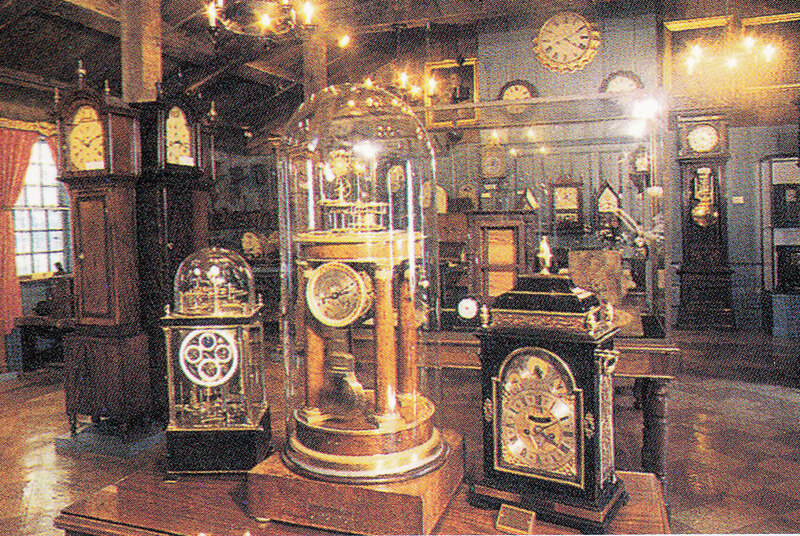 1,500 clocks and watches comprise this collection. A person could go, umm, cuckoo, if the clocks weren’t all the same time. Fortunately and amazingly they’re synchronized. A feat even Superman doesn’t have on his resume. He leaps tall buildings in a single bound, sure, but can he attune hundreds of clocks? Nope, not that I’ve heard of. You? The clocks date back to 1680 and the watches to 1595. Shazzam. The majority of the collection is from pieces made in Connecticut, which was a renowned clock manufacturing area of the 19th century. A clock-maker apprenticed for seven years. About the same as medical school…. In the early days of the railroad, clocks had both local time and RR time. Local time was based on when the sun was overhead at noon. This varied with each town as the train traveled East to West, so there needed to be a consistent RR time to know the train schedule. Clocks with both times lasted about 10 years, and in November 1883 time zones were created using railroad time as the standard. Do you have a collection of 1,500 anything? Do you like small museums? What’s been your favorite? Can you swing a pocket watch into your vest?